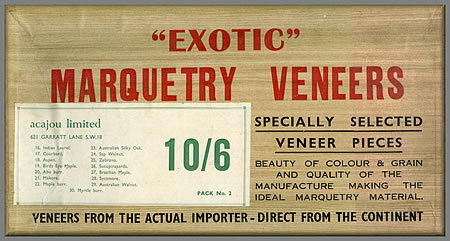 Here we have a package of "Exotic" marquetry veneers from the 1960's. Veneer supplies in those days was rather different to the methods we use today. and hope for the best with the veneers you were sent! In this case they were very good examples we are pleased to say. The "Exotic" marquetry veneers priced at 10/-6d or 52.5p in today's money.